Over the past year, numerous scoops and a major leak, accompanied by several official releases, have shed light on many details on the 2012 Mercedes SLK. In fact, we were expecting the German maker to bring the third generation roadster to the 2011 Detroit Auto Show, ahead of its projected March debut. Even though that never happened, today, Mercedes finally released the last pieces of the SLK puzzle. There will be two models of the 2012 Mercedes-Benz SLK-Class available in its first year, both powered by direct-injection engines. The completely redesigned V6 engine in the SLK350 develops 302 hp from its 3498 cubic-centimeter displacement, using this power to accelerate in 5.4 (est.) seconds from 0 to 60 mph (top speed 155 mph). Its fuel Later on in the model year, the SLK250 goes on-sale with a four-cylinder engine developing 201 hp from a displacement of 1796 cubic centimeters. The SLK250 is equipped as standard with a 6-speed manual transmission and consumes an estimated 27 mpg (combined). From a standstill it reaches 60 mph in 6.5 seconds, and it has a top speed of 155 mph. The 2012 SLK has generous interior dimensions. To achieve this, the designers have developed interior appointments that offer the driver and passenger the highest degree of quality and pure precision. The interior is characterized by stylish sportiness and genuine high-quality materials which have been processed with perfect precision and skilled craftsmanship. Standard brushed aluminum trim covers the center console; wood trim can be ordered as an option in high-gloss dark brown walnut. Four round, metallic air outlets integrated in the dashboard emphasize that this model truly belongs to the Mercedes-Benz sports car family, their shape being a nod to those in the SLS. SLK 350 BlueEFFICIENCY: 52,300.50 euros. 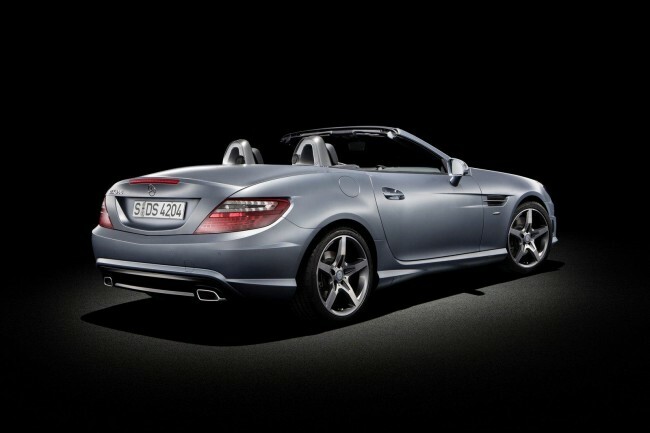 The 2012 Mercedes-Benz SLK-Class goes on-sale in the U.S. this summer. Claimed to offer a 25% increase in fuel economy compared to the previous model, in Europe, the SLK will be available with three engines, all of them featuring direct injection and stop/start systems. 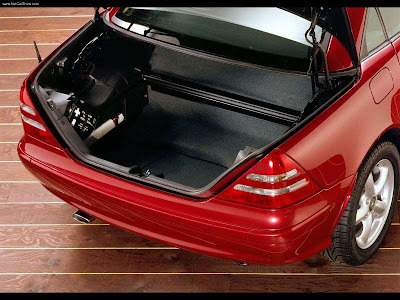 Filling in the base model's shoes is the SLK 200 BlueEfficiency variant, powered by a 1.8-liter four-cylinder powerplant, capable of 184 hp. Mated to a seven-speed 7G-Tronic Plus automatic transmission, the four-pot needs just 6.1 liters of gasoline per 100 km (38.6 US mpg) in the combined cycle. The SLK 200 sprints to 100 km/h (62 mph) in 7 seconds and has a top speed of 237 km/h (147 mph). Next up is the SLK 250 BlueEfficiency, fitted with the same engine, but tuned to deliver 204 hp. It accelerates from standstill to 100 km/h (62 mph) in just 6.6 seconds and maxes out at 243 km/h (151 mph). Furthermore, the extra oomph doesn’t take its toll at the pump, as the SLK 250 consumes 6.2 lt/100 km (38 US mpg). The top dog of the line-up will be the SLK 350 BlueEfficiency, motivated by a newly developed 306-horsepower 3.5-liter V6. The bevy of technology found under the bonnet helps the range-topping SLK return good mileage as well (7.1 lt/100 km or 33 mpg) and sprint to 100 km/h (62 mph) in 5.6 seconds. Top speed is pegged at 250 km/h or 155 mph. In the U.S., the new generation of Merc's roadster model will be offered in two variants, the 302HP SLK 350 (0-60mph in 5.4 sec) and the 201HP 1.8-liter four-cylinder SLK 250 (0-60mph in 6.5 sec, 27mpg combined with the standard 6-speed manual gearbox). The base models will come with a conventional steel suspension, while optional goodies include a sports suspension with harder springs and dampers and the Dynamic Handling Package with continuous adjustable damping, further refined by a better steering system and torque vectoring brakes. There are plenty of electronic gadgets on the menu as well. Aside from the innovative (and optional) Magic Sky Control panoramic glass-roof, owners will also be able to enjoy the benefits of the Airguide draught-stop and Airscarf heating system, ensuring that open-top motoring is possible even in cold weather. Regarding safety, Mercedes says the new body structure offers better protection, complemented by active features, such as PreSafe and Presafe Brake. The 2012 Mercedes SLK can be ordered in Europe from January 17, for a base price of 38,675 euros (SLK 200), including VAT. The more powerful variants will cost 44,256 (SLK 250) and 52,300 (SLK 350) euros. To mark the launch of the car, Mercedes will offer a special edition equipment package. Named “Edition 1”, the package includes a panoramic vario-roof, Dynamic Handling package, AMG bodykit, two-tone Designo nappa leather with contrasting topstitching, Airscarf, ambient lighting and more. Additional charges range from 8,490 to 8,990 euros, depending on the model.